The Courson Archaeological Research Laboratory is approximately 2.5 miles (4 km) west-northwest of the westernmost Buried City Locality habitation sites. This locality was occupied during the Middle Ceramic period (A.D. 1250-1400). Excavations conducted by Courson Archaeological Research at this locality in 2003 documented the use of numerous cultigens and native plants. Domesticated cultigens recovered included maize, beans, squash, sunflower, and marsh elder. Abundant horticultural tools and large subterranean storage pits further support the contention that these Odessa phase societies were dependent on locally grown cultigens. These findings came as somewhat of a surprise to many archaeologists who had long believed that subsistence economies west of the 100th meridian did not include a substantial horticultural component. 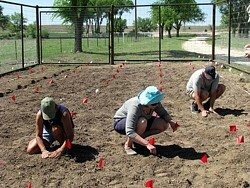 To better understand the feasibility, as well as the challenges of practicing horticulture on the High Plains, the staff at Courson Archaeological Research initiated the Wolf Creek Indian Garden Project in the spring of 2009. The gardening techniques used in this project are not intended, at least initially, to represent a comprehensive attempt to duplicate those of the Buried City locality or other Odessa phase localities to the north and east in Oklahoma and Kansas. Nonetheless, the garden should provide valuable insights into the adaptive benefits and limitations of subsistence gardening on the Southern High Plains using heritage varieties of corn, beans, squash, sunflowers, melons, etc. originally developed by Plains and Southwest societies. 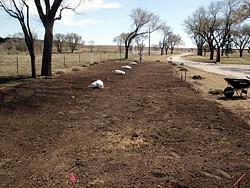 The following provides an overview of the early stages of this gardening project. These stages include preparing and planting of the garden. The latter includes a description of the planting methods, garden layout, and the heritage seed varieties included in our garden. Later, as the first year of the project unfolds, we will continue to present updates as to the progress of the garden throughout the growing season until harvest this fall. First, a brief of the garden location and local climate is provided. The Wolf Creek Indian Garden is about 14 miles south-southeast of Perryton, Texas. The specific location selected for our Indian garden is on a flat, second terrace adjacent to Wolf Creek, a tributary to the Beaver River. The soil mapped in this immediate setting is Bippus clay loam. The Bippus series as described by Wheeler (1973:8) “consists of deep friable, well-drained soils. These soils occur below the High Plains escarpment and occupy low foot slopes and valley floors. In a representative profile the surface layer is dark grayish-brown clay loam about 18 inches thick.” Wheeler (1973:8) goes on to state that the “permeability is moderate, and the available water capacity is high. Soil blowing is a slight hazard. … Included in mapping were small areas of Berthoud loam, Mansker clay loam, Potter soils, and Spur soils. This soil is well suited to most crops grown in the county, and also to range. Water erosion is a moderate hazard.” The soil capability of the Bippus and Spur soils are IIIe2 and IIe-1, respectively (Wheeler 1973:8). Importantly, these two soils represent two of most fertile soils in the county and are the two most common soils associated with Buried City locality habitation sites. As such, it believed that these soils were likely targeted by Odessa phase societies for the placement of their gardens. 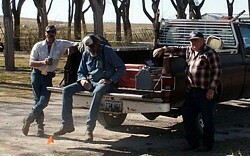 The climate for Perryton, Texas is described as a dry, steppe climate with mild winters. The annual precipitation for Perryton averages nearly 21 inches (Table 1). Rainfall is very variable and most frequently occurs as thunderstorms. Nearly 80% of the total annual precipitation falls between the months of April through October. The most intense winds are associated with thunderstorms. Although strong continuous winds can occur during any month, they are most common during March and April. The average date of the last freeze in spring is April 18th and the average date of the first freeze in the fall is October 26th. The average length of the growing season (i.e., freeze-free period) is 191 days. Construction of the Wolf Creek Indian Garden began in early April 2009. Given that the garden location was covered in native Buffalo Grass (Bouteloua dactyloides) and had never been broken, the first step in preparing the garden was to plow up the plot and break up the tough sod. 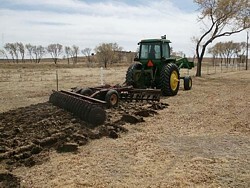 A tractor and an offset plow were used turn the sod over to a depth of about 7 inches (Figures 1 and 2). Two passes were made with the tractor to thoroughly break up the soil. The total size of the area laid out for the garden was approximately 120 ft. north to south by 25 ft. east to west. 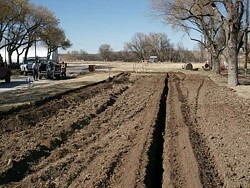 After the garden was plowed we began trenching to install an underground water line to the site of the garden (Figure 3). Along the west side of the garden two yard hydrants on risers were installed. A second line, running north to south down the center of the garden, was laid. 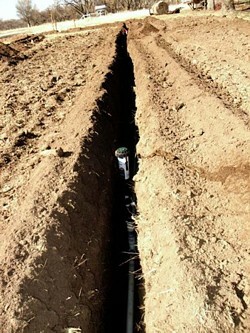 Four pop-up sprinkler heads, which water an area 25 ft. in diameter, were installed on this line (Figure 4). Altogether it took about a day to complete the installation (Figure 5). Upon completion of the water lines we raked out as much of the grass, roots, rocks, and other trash as was possible (Figure 6). All of the grass was laid to the side of the garden to begin a compost pile at a later date. At this time several of the low depressions in the garden were also leveled. Earlier in March, soil samples approximately one cup in size were collected from all areas of the garden. 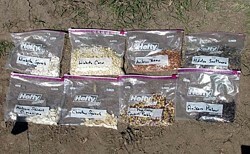 These samples were consolidated into a single sample and were submitted to the Soil, Water and Forage Testing Laboratory in College Station, Texas for soil analysis. The soil analysis, which measured for pH, conductivity, nitrate, phosphorous, potassium, calcium, magnesium, sulfur, sodium, iron, zinc, manganese, and copper, were received at the end of March. These results indicated that our garden soil was slightly low in nitrate and phosphorous. We would like to thank Kole Ballard, Dex Stinson, and Robert Unterkircher of the Natural Resources Conservation Service (NRCS) Perryton office for collecting, submitting, and paying for the cost of these samples. To raise the levels of nitrate and phosphorous in the garden using organic supplements a garden consultant with Pampa West Texas Landscaping was contacted. He recommended that initially we should spread a thin layer of cotton hull mulch over the garden (Figure 7). He also recommended that a small amount of blood meal be spread among the plants after the garden was planted. The next step in preparing the garden was to thoroughly till the soil. This not only helped to further break up the soil, but it also helped mix in the organic mulch we had spread over the garden (Figures 8 and 9). 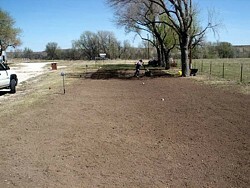 After tilling the garden it was once again necessary to rake out the remaining buffalo grass, roots, and other trash. Once this was completed, it was apparent that the initial tilling had only reached a depth of about 4 to 5 inches. As such, we went ahead and tilled the garden again. 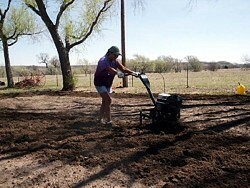 After tilling the garden a second time the soil was thoroughly broken up to a depth of 8 to 10 inches. Being located near the banks of Wolf Creek it is common to see a wide variety of wildlife at the Courson Archaeological Research laboratory. We have seen white-tail and mule deer, coyotes, bobcats, raccoons, skunks, opossum, cottontails, jack rabbits, turkeys, squirrels, armadillos, and a mountain lion. 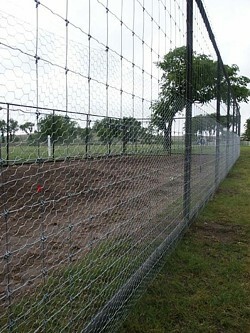 As a result, it was necessary to construct a game proof fence around the Wolf Creek Indian Garden. 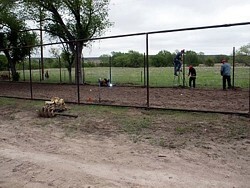 Construction of the fence began on May 4th and completed by the morning of May 7th (Figures 10 and 11). 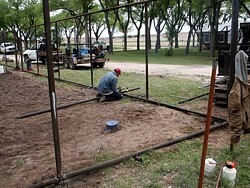 The framework for the fence consists of 4.5 inch pipe corner posts with 2.5 inch pipe for the interior posts. All of the posts were set in concrete. After the posts were set 2.5 inch pipe was welded across the tops of the posts and along the ground between the posts for additional bracing. Once the posts were all set 8 foot tall game fencing was stretched tight and attached to the posts. This type of fencing has 6 x 6 inch wire mesh openings near the top that gradually get smaller to a size of 2 x 6 inch at the ground. Although the above fence would surely keep out the bison, deer, and elephants, smaller animals, such as squirrels and cottontails, would likely be able to squeeze through even the smallest mesh openings. As such, chicken wire with 1 x 1 inch openings was run from the ground up to a height of 4 feet (Figure 12). Along the south end of the garden a 10 foot wide swinging gate was installed for access to the garden with a pick-up or tractor. A smaller 4 foot wide swinging gate along the west side of the garden was also installed for regular day-to-day access to the garden. The completed garden fence is certainly heavy duty and has caused numerous inquiries from neighbors as to when the bison are going to be delivered! Nonetheless, while we do not expect to keep all of the wildlife out of the garden, it should help deter most of the larger animals. 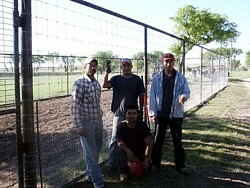 We would like to thank our fencing crew for the excellent fence that they built for our garden (Figure 13). With the fence completed we were finally able to begin planting our garden on May 7th, 2009! Along with our regular crew of Courson Archaeological Research staff a few of our local volunteers also showed up to help with the planting. Following the layout related by Buffalobird-Woman to Gilbert Wilson, we laid out our garden in the traditional Hidatsa manner (Figure 14). 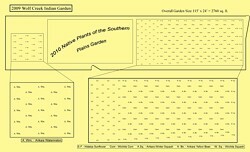 All of the seed for the garden was provided by Fred Schneider of Norman, Oklahoma (Figure 15). Throughout the entire process of preparing the garden for planting Fred provided extremely useful information and advice. Thank You Fred for all of the help and interest in the project! The first day we built a row of low mounds about 10 to 12 inches in diameter along the west, south, and east perimeters of the garden. In these mounds, which were spaced 4 feet apart, we planted Arikara (Cucurbita maxima) and Wichita Winter Squash (Cucurbita mixta) that had been started in pots in a greenhouse about a week an a half prior to planting (Figure 16). When planted in the garden the winter squash plants were between 8 and 10 inches tall. 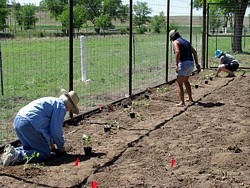 In all we planted 11 mounds of the Arikara Squash and 15 mounds of the Wichita Squash. In the interior of the garden we built up a series of low mounds laid out in east to west rows spaced 3 feet apart. The mounds in these rows were offset from one another to form a checkerboard pattern. The rows were alternately planted with Arikara Yellow Beans (Figure 17) and Wichita White Corn (Figure 18). Seven or eight corn kernels were planted per mound and 4 beans were planted in each of the bean mounds. A total of 50 mounds in 10 rows were planted in corn and 50 mounds in 10 rows were planted in the beans. Immediately to the north of the corn and bean rows we planted six rows of Hidatsa Sunflowers. Once again, we staggered these rows to form a checkerboard pattern. A total of 44 mounds of sunflowers were planted in 6 rows spaced 3 feet apart. The distance between individual mounds was about 3 feet. A total of 3 seeds were planted in each mound. The southern two-thirds of the garden essentially receives full sun throughout the day. Along the northeast side of the garden we have a couple of trees that shade the northern third of the garden until about 2:00 in the afternoon. While we left most of the northern one-third of the garden unplanted until next year when we will plant a variety of native plants known to have been used by the Kiowa, we did plant some Arikara Watermelon in the far northwestern corner of garden. 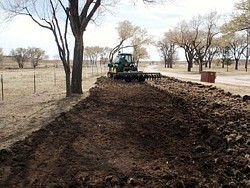 Here we planted a total of 23 mounds in 5 staggered rows. A total of 4 or 5 seeds were planted in each of the watermelon mounds. It has now been 12 days since we planted the squash, corns, beans, and sunflowers and 11 days since we planted the watermelon. The Wichita Corn all came up on the 10th day, the beans and watermelons on the 11th day. We are still waiting for the sunflowers to come up. Since we completed planting of the garden we have contacted the Gifted and Talented Classes instructor with the Perryton Independent School District and the 4-H and FFA programs also in Perryton to have these groups come and visit the garden. We have purchased a number of books that contain traditional stories about Native American gardening and plan on relating some of these stories to these groups as they come and tour the garden in the upcoming months. These books include The Sunflower Garden by Janice May Udry, Native American Gardening: Stories, Projects, and Recipes for Families by Michael J. Caduto and Joseph Bruchac, and Native American Gardening: Buffalobird-Woman’s Guide to Traditional Methods by Gilbert L. Wilson.